Why do you only sell metal prints? I prefer to have my work printed on metal because of the depth and vibrancy it brings to my images. Looking at a metal print hanging on the wall looks more like looking through a window than looking at a piece of art on the wall. All of the metal prints I make have a float mount (on the smaller prints) or an inset frame with a hanging wire so they stand out from the wall which heightens the sense of depth. Can I get a print on other materials? Yes! Unfortunately, not through the website at the moment though. I can get prints in a number of sizes, printed on photo paper, fine art paper, acrylic, glass, wood, and canvas wraps. Email me at *protected email* and we can get the process started! Where did you get the Geeky Monkey name? This is a question to which there should be a spectacular story – something like a cross between Indiana Jones and Star Wars, where I have the nickname “Geeky Monkey” bestowed upon me by the legends of photography after experiencing harrowing danger and dangerous heroism. The story should then continue with the nickname sticking throughout my life and defining who I am. The truth is that I tend to collect domain names for some reason. At some point in grad school, the phrase came to me, I liked the rhythm and I self-identify (willingly!) as a geek, and the geekymonkey.net domain was available. I purchased it. At some point in the hobby beginnings of my photography experience, I decided I wanted a website that people could go and see my images. I wasn’t doing anything with the geekymonkey.net domain, and decided that I’d use GeekyMonkey as my photosite. About that time, the .photography and .photos top-level domains were just coming out and I decided that would be FAR cooler than a plain old .net domain, and so I added new domains to my collection. I’m still not doing anything in particular with geekymonkey.net (it just points back here right now, as does geekymonkey.photography). I should figure out something to do with it. People who have visited the gallery have called me “Andy Geeky Monkey”. They may have had alcohol before visiting though, and it hasn’t stuck (nor has there been harrowing danger since their visit, for which I am thankful!). That first story sounds better though – let’s go with that. I was living in Florida and we were visiting various gardens and parks. I began to see images and wanted to capture them, so I got a Powershot A620. When I left graduate school and moved back to Minnesota, one of the first things we did to celebrate me having a “real” paycheck again was to go get a used DSLR and lens. I ended up with a Canon 5D and the Tamron zoom lens I still use, and was hooked. Over time, I continued to occasionally go out for photo shoots, but photography was largely a sometimes hobby whose main goal seemed to be to accumulate images on my hard drive. My wife would encourage me from time to time to do something more with my images, even going so far as printing out and framing one of them. She and my mother-in-law asked for a calendar one year, which I created, but still I didn’t do much beyond take snapshots and the rare lucky photo. 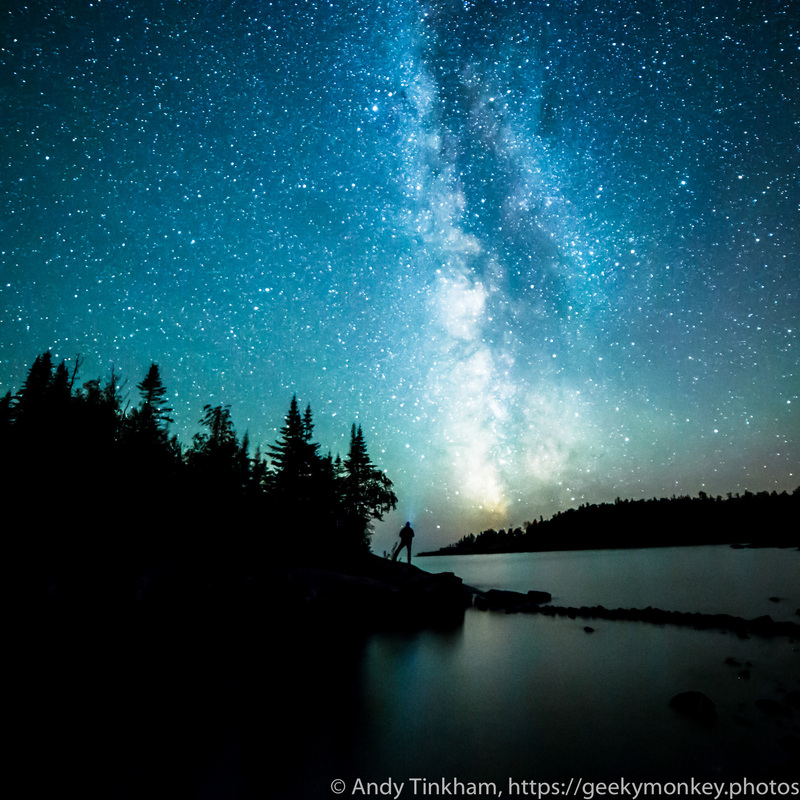 In September 2015, my mother-in-law gave me a registration to Bryan Hansel’s Night Skies of Lake Superior workshop as an early birthday present, and I was transformed by the experience. I had tried a little to take pictures at night without a lot of success. Taking Bryan’s workshop, I learned a ton and came back with a large number of great photos that only improved with the Lightroom processing info I also got from Bryan (and his presets for Milky Way and night sky images). I was hooked. My wife set that hook by inviting me to be a guest artist in her studio. Her studio mate was having her work featured elsewhere and was going to have an empty wall during the November Art Attack weekend and throughout the holiday season. We chose a number of photos that came out well, printed them and got them framed. We had an opening reception the Thursday night before Art Attack and that cemented my view of myself as “photographer” instead of “guy with camera”. In May 2016, our studio mate decided to cut back on the amount of space she was paying for, and I entered the Studios at Chautauqua Lane as a full resident artist. Since there’s not a lot of night or landscape images to take inside the Northrup King building, most of my space is gallery space. I do hope to sometime soon start trying to create images inspired by the images of Kim Keever and others who include elements of paint and other liquids diffusing in water in their work. When I get to the point of making images I like, I’ll post them here, of course! Come back frequently to see what new images are posted! You have a non-photography full-time job? What is it? My main job is to be the QA Practice Director for C2 Solutions, a local consultancy in the Twin Cities area. As Practice Director, I set the vision for the practice. My day-to-day work includes billable work for clients, supporting my practice members as they do billable work, helping my account executives with the sales process, performing technical interviews of all our QA candidates for recruiting, building internal community amongst my consultants so that we’re not just little clumps of people who never see each other or interact except at the summer event and holiday party, and doing things to build C2’s reputation in the QA and Software Testing space. See my hub site, andy.tinkham.org, for more on my software testing work. My current camera is a Canon 6D body which I love, and with which the majority of images on the site were taken. Some of the earlier images on this site may have been taken with a Canon 20D, a Canon 5D, or a Canon Powershot A620. For lenses, I use a Tamron 28-300mm f/4-f/5.6 zoom, a Canon 50mm f/1.8 and a Rokinon 14mm f/2.8. Most of the night images on the site were taken with the Rokinon. Next on my list of lenses to obtain is a 16-30mm fast zoom. Then after that, a longer telephoto lens – maybe something that goes out to 600mm or even 1000mm (though I’m not sure I want to lug that around!). My tripod is a Manfrotto. It’s nearing 20 years old but still works great. It’s got padded legs and spikes so it works well in Minnesota winters! The main place to see my work is in my gallery space – studio 155 at the Northrup King Building in northeast Minneapolis (1500 Jackson St). We’re right in the corner of the building where the first floor hallway turns 90º. If you come in the main entrance (under Dan Mather’s wonderful color changing light fixtures and facing the Tres Leches gallery), go forward to where you can go left or right down the long hallway. Turn to the left and look all the way down the hallway. If we’re open, the doors to our space will be open and you’ll see into it as you look straight down the hallway. We’re open most Saturdays from 12(ish) to 4 (ish), the first Thursday of most months from 5 to 9pm, and during Northrup King Building and Northeast Minneapolis events including Art-a-Whirl, Art Attack, and Northrup King Nights. We may also be available at other times by appointment. In September 2016, you can also see my work at the Hallberg Center for the Arts in Wyoming, MN, where the Wyoming Creative Arts Community is hosting the In.Art Show. My piece, Power Plant at Night, was accepted into the show and won an Award for Artistic Excellence! The Hallberg Center is open 4-8PM Tuesday through Friday and 12-4PM on Saturdays through the month of September. Also in September 2016, I will have a piece, To Infinity and Beyond!, in the NEMAA Fall Fine Arts Show at the Solar Arts Building in North Minneapolis. The gallery there will be open Thursdays and Fridays from 5-9PM and Saturdays and Sundays from 12-6PM between September 16 and 25. There’s an opening reception from 6-10PM on the 16th, as well. Will you shoot my [wedding | graduation | bar/bat mitzvah | other event]? I’m flattered you’re interested in having me take pictures of your special occasion, but no, I’m just not that type of photographer. People move, landscapes don’t (much). Also, I have a non-photography full-time job, so running Geeky Monkey – enabling print sales, new images, accounting (ugh, accounting), website building, order fulfillment, making new products and all the other tasks inherent in running the business have to fit in the spare time around the work week so the chances that I’m actually free at the time of your event are, alas, vanishingly small. You may want to contact Kristine Leuze or Bryan Hansel, both of whom I believe take commission work as well as taking excellent photographs.